In a five-day long test cricket match, a batsman generally takes some time to make himself comfortable at the crease, to understand the bowling strategy of the bowler. He is never in a hurry to play a critical shot that can take him back to the pavilion. There are some books also which take a lot of time to gain pace. So much time that you may find it an alluring option abandoning it. But somehow, you continue reading to see what’s in store for you. Ritoban Chakrabarti’s When She Smiled is the book for which I’m making such prelude. The book, by now you’ve understood, is a slow one without any significant twists or turns. Set in the backdrop of the picturesque hill station of Shimla, the story revolves around a fifteen-year-old Bengali boy, Mrityunjoy Roy, who returns to Shimla after spending two years at the Sainik school and, rejoins his alma mater, DAV School. Here he meets Akanksha, his classmate and falls in love head over heels. Her mesmerizing smile and gorgeous looks enthrall Roy and, the teenage boy experiences the first love of his life. Akanksha joins Roy’s tuition classes and, their friendship intensifies. Quite naturally, the loving friendship or puppy love makes others looking upon Roy with green eyes of envy. Then something happens and, Akanksha chooses a different path far away from Roy. Roy thinks himself bereft of everything in life. All his laughter, joy, and hope gone with the girl he loves with all his heart. At the same point of life, he confronts with another harsh reality, the death of a near and dear one in his family. The adolescence boy fights with himself to restore normalcy in his life again and comes in harmonious terms with his destiny through a series of events. The storyline is simple and so is the narration. I liked the way the author has presented Shimla, a grand pictorial delineation. Roy’s ecstatic expression on the first snowfall of the season, “Waking up to the first snowfall of the season is the best feeling in the world“, makes me smile. I feel nostalgic recalling my own experience that resonates with Roy. The little mischievous acts of camouflaging story books within the covers of the textbooks has enlivened my childhood. I also liked the short, poetic dialogues exchanged between Roy and Akanksha. The way a teenage boy feels of his first love and the labyrinth of the relationship, all are drawn quite beautifully. The characterization of Roy’s parents, the way they fight over trivial issues, their feeling that spending on recreation or entertainment is not a wise enough decision, present a wholesome picture of that point of the time, when mobile phones, internet, and such other gadgets were not an integral part of life. When parents were much rigid and, their sole consecration was to make their children academically sound. The very chord of the story dates back to that era. But, I’m sorry to say that the author has overkilled the story with too much of monotonous descriptions. The writing style is not engaging and things also become quite predictable with the progress of the story. Just as a house can’t stand erect without a strong foundation, in the same way, the book lacks a tight plot. The story is emotionally charged, good for a prime-time serial or some Bollywood movie. Moreover, I’m not satisfied with the language used and, there are some grammatical errors too, the author would have been more cautious with the editing. 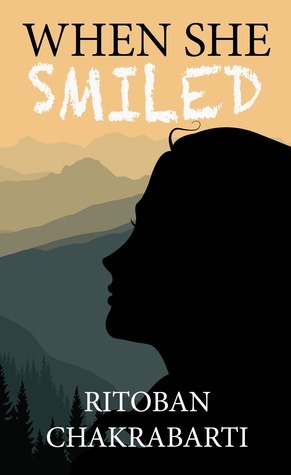 Throughout the book, I was searching for the reason of the title, When She Smiled. My hunt ended at the closing chapter and though the author has justified the reason for the title, I find it somewhat vague and abrupt. The ending, in fact, could have been much better and interesting. However, I believe, the author has the potential to produce something more enjoyable and worthy. I wish fair wind to his sail for his next publication. A good read for CB fans may be, or you can read it to ‘kill’ your time while waiting in the hotel lounge or in an airport. For me, it was just an average, one time read. Interesting take, I must say and you are right! There was nothing to keep readers hooked on and that’s why my overall verdict matches yours. I liked the way the author has gone back to the days when there were no cell phones or internet. Young love & the pains of growing up. I really like the honesty of your review! That;s a good review is all about! Thanks so much Maniparna and have a wonderful weekend! Always interesting to be a bit experimental — like leaving out of plot — and seeing what happens. Sometimes it works, And sometimes not so much. But he made some good constructive criticism that could be incorporated into the next work. I am not going to pick it up and if I do then only for the description of Shimla you have mentioned . Infact i enjoyed your review 🙂 (as usual) . Only thing hooked me is the poetic dialogues between hero & heroine. You may be right about the book, but the story is one that we all can relate to. Yes, it reminds you of your teenage days. But the style of narration is dragging and monotonous. 😦 …it’s mostly because of that I gave it a 3 star rating. Otherwise, I liked the simple plot, which, I think, could have been developed into a much better book. I can probably collaborate with you. Give you ideas. You are much better writer than me. I look at your stories and I feel that all the time. A small book may be, for lazy people like me. You should though. It will be a pleasant thing to hear about your book. Will look forward to it. Telepathy :O May be. Blog telepathy. To me, it appears that possibly this novel is atleast based on his personal emotions, Possibly those factors overpowered him. If i have nothing to do and wait in thw waiting hall for hours together I prefer to read Chetan Bhagat but not a hybrid. As I am now moving in field locations I am unable to take part in this. By the time the summer starts and I am back to my seat in the corporate office this wonderful reviewing contest shall be all over. Anyway happy reading.